As a group officer, you can view refund requests made to your group. Click on "Money" and then on "Online Revenues" on your left-side menu. Accept or deny the refund by selecting the applicable option in the dropdown. Select a quantity of tickets and enter the total amount refunded. Write up a response for the user as needed and hit "Submit response". Your decision will then be communicated to the user directly and if a refund - partial or complete - has been granted, the school administration in charge of refunding the actual money will also be notified to do so. That person will then similarly confirm that the money was refunded under his/her Money section, once the refund has effectively been completed. Receive an email notification when someone asks for a refund by checking the "New refund request" checkbox under "Notifications" in the top menu. Note: The "Refund Request" feature is optional. 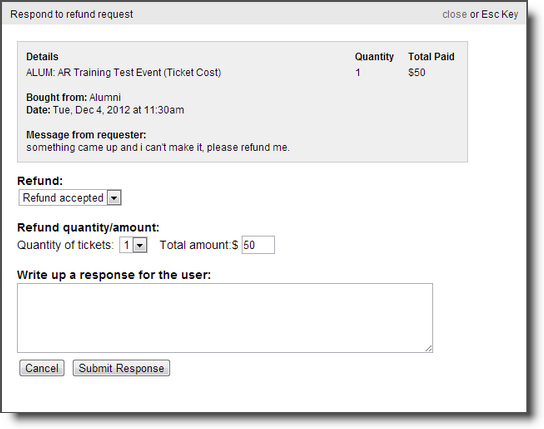 If you don't see the "Refund" button, it is probably because this tool has not been set up for your school. Please contact the support for more information.